In einer ruhigen und beruhigenden Umgebung, Bett Thatch bietet qualitativ hochwertige Dienstleistungen, besondere Momente mit Ihrer Familie, Freunden oder Arbeitskollegen zu teilen. Das Haag kann bis zu 16 Personen, große Wohnräume beherbergt. Sie haben mehrere Gärten mit Möbel, Grill, Liegestühle. Umgeben von 5 Hektar außerhalb für Sie zu genießen, wie Sie wollen. • Einen begrünten Innenhof und ermöglicht es Ihnen, das Vergnügen zu genießen auf der Terrasse zu speisen. Ihre Kinder sicher spielen können: spielen mit einer Schaukel. Wir bieten Ihnen Tischtennisplatten. • Gemüsegarten Sie zur Freude der Gartenarbeit einzuführen und genießen Sie Gemüse und gesunde und schmackhafte Früchte. Je nach Jahreszeit, ein beheiztes Schwimmbad 12m x 5m mit großem Strand herum, werden Sie die Sonne und einen schönen Blick auf die Landschaft von Tours genießen. In der Nähe der Städte von Descartes, Sainte Maure de Touraine, Loches Sie in den lokalen Geschäften in allen Produkten finden, die unsere Region ein Ort der beliebten Gastronomie machen. Loches Märkte am Mittwoch, bei Sainte Maure de Touraine am Freitagmorgen (große überdachte Halle, wo der Sainte Maure de Touraine, PDO herrscht, hergestellt in der Touraine Ziegenkäse aus Rohmilch, konischer Form und überquerte einen Roggenstroh ) Morgen Descartes sonntag. Im Zentrum einer Region vollen Kulturschätze: Das Loire-Tal ist ein idealer Ort für die Entdeckung der Schlösser und Museen in der Touraine. das Haus ist komplett ausgestattet mit modernster Ausstattung und guter Qualität ausgestattet. Très bon séjour. Très bonne prestation. Très bon état et standing. The two of us (grandparents) stayed for a week with our four children, their spouses and their children. That made 10 adults and 11 children. 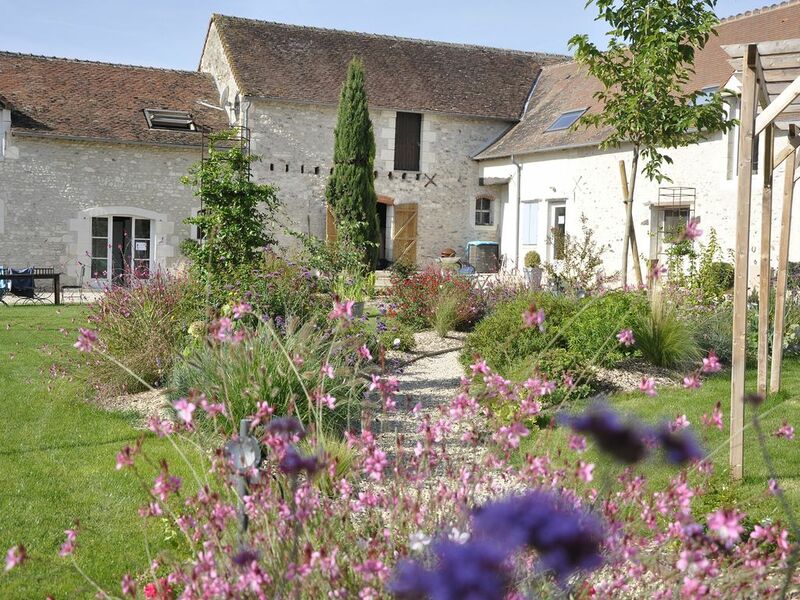 We stayed in one of the bigger gites plus the smallest, La Haie and Le Cremier, both facing the courtyard,. We decided that the family with the oldest children (5, 6 and 8) should stay in Le Cremier, because the stairs are very steep and potentially dangerous for small children. The stairs in La Haie are also quite steep, but they are protected on both sides. The owners, who live on the property, were helpful, ready to answer questions, but not intrusive. We had the large, heated pool pretty much to ourselves, although there was another family there at the same time as us. The children were entertained by the chickens and the sight of horses. While we were there, there were a lot of flies in La Haie, so you need to be prepared to buy fly papers and other fly-killing devices. This was a minor inconvenience, and equipping several young children with a fly swatter each turned fly-hunting into an entertainment. There are plenty of chairs, and we were able to all sit around a big table in the main gite, and also outside around two large plastic tables. Both gites were well-equipped, with a dishwasher, washing-machine and a good cooker. There is no air-conditioning, but there are fans, although you might want to take an extra fan or two, as we did. The satellite television only has French-language channels, but there is a DVD player (not blu-ray), which is a pity, given the huge flat-screen television. We were able to hook up both an ipad and a laptop to watch films we took with us. Wifi and mobile coverage were patchy, but this should just encourage you to stay by the pool, which is fenced in and surrounded by a very comfortable area with plenty of shade and lots of sun-loungers and chairs. Four families of us with young children spent a fantastic week at La Chaume. The setting in beautiful countryside was wonderful, in particular we enjoyed visiting the beach and swimming area at the river to the south of Descartes. The set up and facilities were ideal for us and our children with plenty of safe space to play, nearby paths and woods to explore and of course the pool! A great place for relaxing breaks, particularly for larger groups. Nous avions loué les 3 gites pour une réunion entre amis, 16 adultes et 17 enfants. Le séjour fut très agréable, chambres spacieuses, grandes salles de bain, le tout décoré avec goût. La piscine chauffée nous a permis malgré le temps couvert de nous baigner, belles balades à pied, le calme et la sérénité. Les enfants ont joué, aux jeux de balles, aux balançoires, avec les poules , observés l’âne et les chevaux. Nous renouvellerons notre séjour et conseillerons le gite de la chaume. Nous avons loué les 3 gites pour nous retrouver entre amis ,16 adultes et 17 enfants, et nous avons passé un excellent séjour. le gite est spacieux, de belles chambres, de belles pièces d'eau, le tout aménagé avec goût. La piscine est chauffée et c'est très agréable car le temps était couvert mais cela n'a pas empêché tout le monde de se baigner. les enfants se sont amusés avec les poules, les chiens, balançoires, jeux de ballons. Belles promenades autour du gite, le calme à la campagne. Les propriétaires bien que présents sur le gite sont extrêmement discrets et disponibles. Babby Sitter auf Anfrage vor Ort.